Fiscal policy: what does "Keynesian" mean? On Sunday, David Smith described me as “a former Cabinet Office economist who has taken the institute [NIESR] back to its Keynesian roots”. Then on Wednesday, Nadhim Zahawi MP talked of “Keynesians such as [Ed Balls] and bodies such as the NIESR”. This prompted a couple of thoughts. What do they mean? And am I, in fact, a Keynesian? A summary of my talk on this topic at LLAKES (the ESRC Centre for Learning and Life Chances in Knowledge Economies) is here, along with a link to my presentation slides, which consist mostly of interesting (I think) charts nicked from other people. Following the GDP numbers published January 25, here is a further updated version of NIESR's chart showing the path of recession and recovery in various previous downturns. 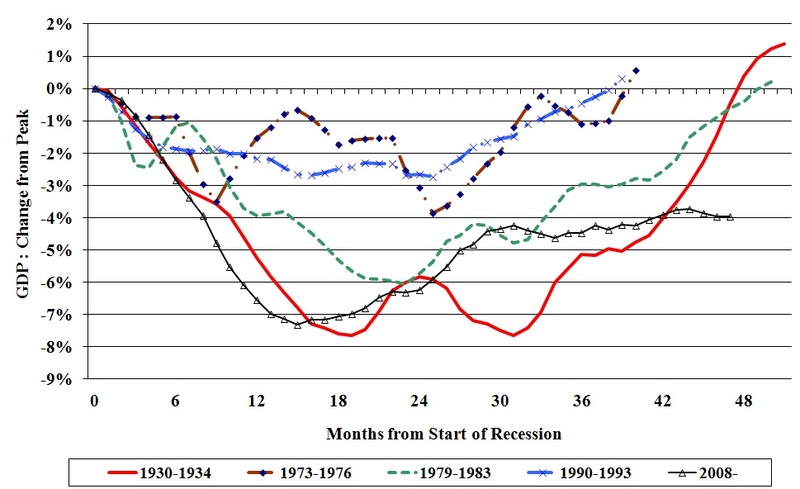 The chart shows that this "depression" - defined, admittedly somewhat arbitrarily, as the time period during which output remains below its previous peak, shown as the X-axis above - is now longer than that experienced during the Great Depression, and is not likely to end any time soon. It also shows how what was initially a reasonably strong, albeit patchy, recovery stalled in the autumn of 2010; since then there has been very little growth . Fiscal space: what does the IMF mean? "those [advanced countries] with very low interest rates or other factors that create adequate fiscal space, including some in the euro area, should reconsider the pace of near-term fiscal consolidation. Overdoing fiscal adjustment in the short term to counter cyclical revenue losses will further undercut activity, diminish popular support for adjustment, and undermine market confidence." David Smith ties himself in all sorts of knots in yesterday's Sunday Times (£). He quotes me as saying: “Our historically very low level of interest rates is — just as in Japan — a sign of economic failure, not success. ” David says: " I find this puzzling...We should celebrate the fact that borrowing costs are so low. " Apparently my views reflect the fact that I've taken NIESR back to its "Keynesian roots". But of course my view on this has absolutely nothing to do with Keynes; it simply reflects the standard neo-classical view (normally credited to Irving Fisher) that, as the Bank of England puts it in its handy beginners guide to monetary policy, "long-term interest rates are influenced by an average of current and expected future short-term rates". I have been writing quite a lot about immigration recently - here and here. 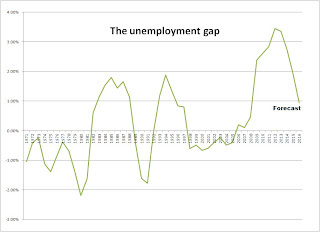 But there’s an unfortunate tendency for dialogues on this topic (oral or in response to my columns) to go something like this: I, or other economists who work in this area, say that the empirical evidence suggests that immigration has little or no impact on employment or unemployment overall. A respondent points to an example – they personally, or someone they know, has lost out on an employment opportunity to an immigrant. Or they note that a particular local business or sector seems to employ mostly immigrants – Pret a Manger in London is a frequent target. We respond, saying that this is “anecdotal evidence”, sometimes (although I try not to use this phrase too much) referring to the lump of labour fallacy, and explaining again what the evidence says about overall or average impact. The respondent then concludes, perhaps understandably, that economists live in a statistical world which has little or no connection with reality; and worse, that when confronted with reality they are not interested. I’d like to try to explain why “anecdotal evidence”, in this specific context, is indeed irrelevant, not because it’s anecdotal, but because it is a partial rather than general equilibrium concept. That is, by definition, it tells you only the local or partial impact of something, which may or not be offset by developments elsewhere in the economy, which – by definition – the anecdote cannot tell you anything about. Migrants, benefits and public services: what does the new research evidence tell us? I am early in the office today - 7.30 am - and the cleaners are just finishing up. Not surprisingly, they clearly were not born in the UK (Brazil? Romania? ), and I think it is reasonable to assume (we use a reputable firm) that they are paying tax and not claiming benefits. But of course anecdotal evidence of this sort proves nothing, so what are we to make of this article, by Chris Grayling and Damien Green, that 371,000 migrants are claiming out of work benefits? At the end of last year, the FT asked me and many other UK economists to answer a set of questions about likely economic developments over the coming year. They summarised the results here, but for obvious reasons didn't go into much detail (perhaps not surprisingly, the only direct quote from me was my joke in the first line of my response to question 1 - an old joke but a good one..). In any case, in the interests of (future) personal accountability, my full responses are below (in order to be rigorous, I have not modified in any way since I sent them in late December, although not that much has really changed since). I have also appended my responses to Mehdi Hasan at the New Statesman, who asked a similar, but not identical, set of questions (his article is here); there is considerable, but not total, overlap/duplication. 1) Recovery: To what extent will the UK economic outlook improve or deteriorate in 2012? How close will Britain be to a balanced economy? One is tempted to say - to paraphrase an old Soviet joke - that 2011 was an average year for the British economy. Not as good as 2010, but better than 2012..
More seriously, under our baseline scenario - that the eurozone muddles through - quite similar to this year, so not great, but not disastrous. Premature fiscal austerity will continue to weigh on the economy, leading to lower growth and unemployment than necessary - and high youth unemployment will do permanent social and economic damage. This will be compounded by eurozone weakness. But as in the US, very aggressive monetary policy will limit the damage, and exports to the rest of the world will help. Moreover, with inflation falling, real incomes will stop shrinking so fast, so consumer confidence may pick up a bit. And, as in the US the underlying position of the UK economy is not as bad as it is sometimes painted; I think the OBR projections for medium to long term potential may be too pessimistic, although in one or two key areas the government is doing its best to reduce growth potential (eg, immigration policy). So with a bit of luck - and ideally, better policies - there is also potential on the upside.. We might even start thinking about what to do about the real long-term problems for the UK and the developed world - unacceptable levels of inequality, and how to make the financial sector serve the real economy rather than extract rents from it for the benefit of a very few. 2) International: How many currencies will exist in the area now called the eurozone by the end of 2012? How effectively can the UK insulate itself from the eurozone? Ultimately the first question is a political question not an economic one. What I would say is that the draft Treaty/agreement that the Prime Minister vetoed is not only the wrong answer to the problems of the eurozone, it isn't even directed at the right question. The eurozone crisis is not the result of fiscal imprudence - if so, the exceptionally fiscally responsible Spanish and Irish would not be part of it - it is the result of the internal imbalances within the eurozone, driven primarily by private sector behaviour. The draft agreement doesn't even pretend to address these issues; if the Prime Minister had declined to sign it on the grounds that it was economically illiterate and damaging, he would have been entirely justified. So we are definitely not out of the woods. If eurozone leaders stick to their current approach, the risks of a disorderly breakup (as a consequence of the political unsustainability of self-defeating austerity in one or more country, and/or a catastrophic bank failure) are high. But the baseline remains predicated on the view that eurozone leaders ultimately understand/will have to understand this, and therefore that both monetary and fiscal policy will respond, either through ECB bond purchases/quantitative easing or large multilateral loans, combined with looser adjustment programmes for the peripheral countries. If so, it won't be pleasant, but the eurozone should muddle through. The consequences for the UK of a disorderly breakup range from the damaging to the disastrous. Clearly any breakup would have a negative impact on exports and hence on our economy, if only through exchange rate effects (the pound would presumably rise sharply) quite possibly pushing us into recession, but not necessarily a severe one. The wildcard is the financial system. If a breakup was accompanied by systemic disruption to the global financial system, which is clearly a significant possibility, then all bets are off. 3) Productivity: What do you think has caused Britain's feeble productivity performance since 2007? What scope is there for a bounce in Britain's productivity growth in 2012? I am not convinced that the productivity figures are much more than a statistical artefact at this stage. Clearly we have lost some output as a result of the crisis, but the magnitude of that loss is far from clear. What is clear is that there is plenty of spare capacity, particularly in the labour market, and with the right policies (and a benign, or at least not disastrous, international environment) considerable potential scope for growth. Over the medium term, although the UK economy has some structural weaknesses (excessive dependence on a rent-seeking financial sector, educational inequality) it has also has a number of strengths (a well-functioning labour market, openness, the higher education sector) and there is no reason, given sensible policies, we should not return to strong productivity growth in the medium term - as we have seen over the past 30 years. 4) Monetary policy: To what extent will the Bank of England have demonstrated its ability to control inflation by the end of 2012? Will it still be buying gilts? One reasonably safe bet is that inflation will fall sharply over the next year, probably back towards the target. Assuming the central scenario above - ie no severe further downturn - it will no longer be buying gilts by the end of 2012. 5) Fiscal Policy: To what extent has deficit reduction been going too far and too fast? Can the UK retain the bond market's faith over the next year? It remains NIESR's view that in the short term fiscal policy is too tight, and a temporary loosening would improve prospects for output and employment with little or no negative effect on fiscal credibility. As for "retain the bond market's faith" it is unclear what this means. The UK will not default, no-one with a brain seriously thinks it will, and the opinion of the rating agencies is irrelevant. We have nothing to worry about on that score. But our current historically very low level of interest rates is - just as in Japan - a sign of economic failure, not success. The government has got the rhetoric and the economic logic completely wrong on this. Gently rising long term rates, back towards levels consistent with decent economic growth, would be a good sign; sustained very low or even falling long term rates would be a very bad signal -perhaps the onset of a lost decade. 6) Credit: Will credit easing be remembered as a transformative policy in a year's time? How should policy address the supply of credit if at all? No - as currently proposed it will have a positive, but probably marginal, impact. Much more radical reform of the UK financial sector is required. 7) Policy: What policy would be most effective in fostering Britain's supply potential? What is the best policy to stimulate demand? On the supply side, we need to look at the short, medium and long term. In the short term, fixing the broken financial sector so that savings can be channelled to productive investment. In the medium term, a host of policies - reversing the misguided and damaging immigration limits on skilled workers and students, which will have a negative impact on growth and innovation, facing down the lobbies on planning reform, and the localisation of public sector pay - could help. Over the long term, nothing matters more than people; the priority should be investing in programmes that will help disadvantaged children, both before and during their school years. Unfortunately while the government means well on this score, and genuinely does understand the importance of reversing the entrenched educational inequalities of the UK system, far too much effort and resources is being devoted to changes to the school system which the international evidence suggests aren't likely to improve things much. And, like its predecessor, it is fixated on targets which incentivise schools and teachers not to focus on those who need it most. 1) How bad a year for the global economy do you think 2012 will be? And why? The baseline scenario is still that we muddle through, with a mild recession in the eurozone, but finally a reasonable recovery in the US and continued growth in the rest of the world, so not great but not disastrous overall. 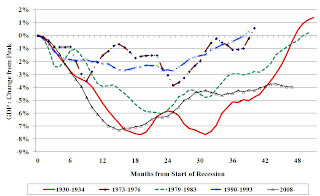 The main drivers of this would be simply that the US has gone through a wrenching period of adjustment in the labour and housing markets, the Federal Reserve has provided unprecedented monetary support, and at some point things have to turn round, given that there's not that much wrong with the underlying US macroeconomy; meanwhile, relatively sensible policies in China and other emerging markets, and continued scope for catch-up, mean continued strong growth. In the eurozone, there will be both too little policy coordination (on the institutional changes and structural reforms needed to boost growth) and too much (on self-defeating austerity) but ultimately it will not be allowed to come apart. This will lead to recession - nasty in places - but not depression, as ultimately the northern Europeans realise that austerity alone will not prevent disaster. 2) How bad will it be for the UK economy? Worse than 2011? Again, why? 3) Are we heading for a break-up of the Euro in 2012? And what would that mean for both Britain and the global economy? Ultimately this is a political question not an economic one, so I'm reluctant to give a straight answer. What I would say is that the draft Treaty/agreement that the Prime Minister vetoed is not only the wrong answer to the problems of the eurozone, it isn't even directed at the right question. The eurozone crisis is not the result of fiscal imprudence - if so, the exceptionally fiscally responsible Spanish and Irish would not be part of it - it is the result of the internal imbalances within the eurozone, driven primarily by private sector behaviour. The draft agreement doesn't even pretend to address these issues; if the Prime Minister had declined to sign it on the grounds that it was economically illiterate and damaging, he would have been entirely justified. So we are definitely not out of the woods. If eurozone leaders stick to their current approach, the risks of a disorderly breakup (as a consequence of the political unsustainability of self-defeating austerity in one or more country, and/or a catastrophic bank failure) are high. But my baseline (for questions 1 and 2 above) remains predicated on the view that eurozone leaders ultimately understand/will have to understand this, and therefore that both monetary and fiscal policy will respond, either through ECB bond purchases/quantitative easing or large multilateral loans, combined with looser adjustment programmes for the peripheral countries. If so, it won't be pleasant, but the eurozone should muddle through. 4) What's the big "unknown unknown" we should be on the look out for next year? The potential political/economic crisis that no one's really paid much attention to? I'm definitely not in the business of predicting political crises, like the Arab Spring. But in terms of major political events impacting the world economy, the obvious potential "risk" is China; I don't see how the current political/economic equilibrium is sustainable in the medium to long term, and the potential for a very disruptive transition - who knows to what? - is in my view high. But the probability of this happening next year is presumably low. 5) What will the world and/or Britain look like this time next year? Please paint me a brief picture.. In an optimistic scenario we'd be well over the worst of the economic downturn, and although it won't be plain sailing, beginning to see concrete signs of improvement. With - see above - an economy that is in underlying reasonable health, we should be looking forward to reasonably strong growth, perhaps better than the current forecasts. With President Obama reelected on the back of a solid recovery in the US, and the eurozone with finally a coherent if not comfortable approach to its problems, there is a reasonable degree of economic policy coordination and a generally much better international atmosphere. We might even start thinking about what to do about the real long-term problems for the developed world - unacceptable levels of inequality, and how to make the financial sector serve the real economy rather than extract rents from it for the benefit of a very few. The pessimistic scenarios follow from 3 and 4 above and I have no desire to spell them out. Economists in government: what are they good for? Since the financial crisis, economists as a profession have come in for considerable criticism, both for failing to predict the crisis and for disagreeing violently with each other about what to do about it. As far as macroeconomics and finance go, it is difficult to dispute that there is a strong case to answer. But the criticism has often extended beyond these topics to a broader critique of what is sometimes described as “economic imperialism”, which could loosely be described as the view that economics was not just about markets or supply and demand, but was a method that could be applied to almost any social policy issue: the “science of choice”. This in turn translates to a view that economists have become too dominant in advising and informing policymakers. [This case is set out well in Ben Fine's book "From Economics Imperialism to Freakonomics"]. In many respects I find this critique quite convincing. But in this post I'd like to focus on the narrower question of what economists within government (or acting as policy advisers) can in fact usefully do to make policy better. Not surprisingly, given my 23 years in the civil service, I do think there are important roles, although in my experience they correspond almost not at all to what outsiders, or indeed academic economists, think economists in government spend their time doing. I would identify three functions (and macroeconomic forecasting is not one of them!). Modigliani-Miller. The fact that the return on an investment should, if markets are working, be independent of the way it is financed, is particularly relevant given the current debate about capital requirements for banks. If every policymaker understood that when bank lobbyists complain that “equity is more expensive, so requiring more of it will reduce lending and raise borrowing rates” they are arguing the contrary, usually without any explanation or justification, then they might be treated with the derision they usually deserve. The paradox of thrift. I have already written here about David Cameron’s apparent failure to grasp this one, so clearly the profession has failed in this respect. Of course I’m not saying that Modigliani-Miller, say, holds always and everywhere; these are results from simple theoretical models, not descriptions of the real world. But that doesn't mean they aren't useful in a real world policymaking context. Each of these models gives a very strong conclusion based on a very clear analytical framework, based on a set of assumptions; if you want to dispute the former, you need to explain which of the latter don’t hold and why, what that means, what your alternative framework is, and (in government) the policy implications. That is an extremely strong and useful discipline in policymaking; and it something economists are well placed to explain and to implement. correlation is not causation. Of course other social scientists know this perfectly well, but it is perhaps most relevant in economics, both macro and micro; it is no accident that the best-known application of this principle to policy in the UK is named after an economist ("Goodhart's Law"). The final, and most difficult because least well-defined, role of economists (and other "professionals" within government) is to assess critically, synthesise, and translate into policy, the research consensus in a particular area. This is difficult for (at least) two reasons. First, it requires judgement. For every paper in social science you can of course find one giving the opposite result. Academic standards - where something was published, the author's contribution to the advancement of theory - don't necessarily tell you what to take seriously and what to dismiss from a policy perspective. Second, while doing this need not be a political exercise, it is inherently and inevitably an ideological one; where you come out will be conditioned by your views, attitudes and background. There is nothing wrong with this, but we need to be aware of it. finally, a more contentious and live example is "expansionary financial contraction", where an academic debate has obvious real-world policy implications, and no consensus currently exists . It is of course my view that the empirical evidence on this is pretty clear - fiscal contraction, under most circumstances, and certainly those obtaining in the UK today, is contractionary. I would argue that economists in government should not use the fact that there is controversy in academia, and that the issue is politically charged, to avoid taking a position on the balance of the evidence. To conclude, as I said, one thing I don't think government economists should be doing is forecasting the economy. That's not because I think (as many academic economists do) that forecasts are a waste of time; you can't run economic, fiscal or monetary policy without a forecast, so they are at least a necessary evil. But there is no reason at all to think that government economists will be better than external ones at forecasting, and a number of political economy ones why they might be worse. Government economists need to be able to explain forecasts, scenarios and their implications to policymakers - but actually making them is definitely not their comparative advantage. First the easy bit. We can dispose quickly of the Migration Watch report. As it says, betwen 2004 and 2011 an extra 600,000 Eastern European workers entered the UK labour force, while youth unemployment rose by 400,000. But the vast majority of that rise in youth unemployment took place during 2008 and 2009. During that period, the number of Eastern European workers actually fell slightly. Is this fall a "remarkable coincidence" too, just in the other direction? 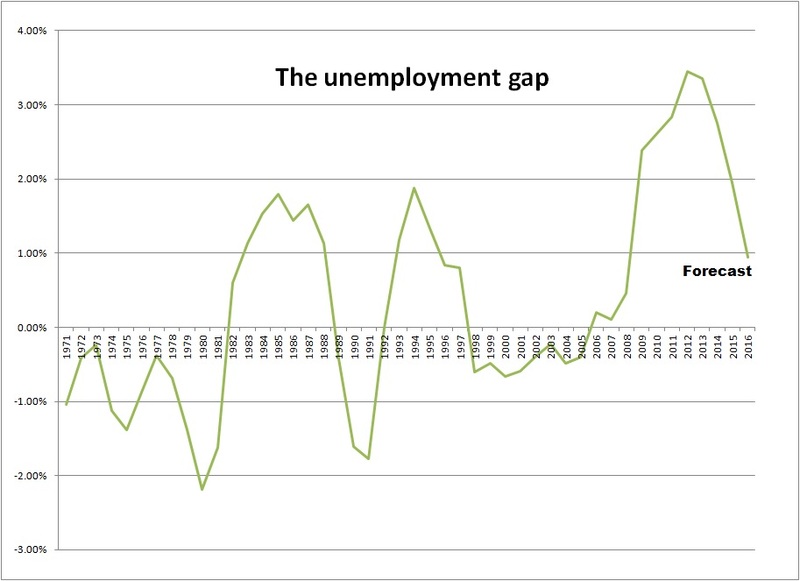 Or is simply exactly how you would expect the labour market to respond? Even on their own terms, the logic doesn’t add up. Nor is this the only hole in Migration Watch's analysis, as Matt Cavanagh points out here. Much more interesting therefore are the differences between our report and the MAC’s. I think three points are important here. First, the two studies use the same methodology, known as the spatial correlation approach. Essentially, that amounts to looking, across different areas, at a) how many migrants came to an area over a given time period and b) what happened to unemployment or employment in that area. If, controlling for other things, areas with higher migration saw (say) higher unemployment, one concludes there is at least a prima facie case that there is a relationship, possibly causal. Second, we use very different data sets. The MAC report uses, as is standard, Labour Force Survey data. The problem with this is that, even though it is a fairly large survey, the number of migrants (especially recent migrants) in many areas is quite small. This means that the study has to look at quite large areas – the 11 UK regions – to get decent sample sizes (it has also been argued that the LFS undercounts some migrants). By contrast, we use, for the first time in the literature, actual data on National Insurance number registrations - the best and most comprehensive measure of people moving to this country to work. This allows us to look not just at regions but at local authority areas, and with considerably more accuracy. So the standard errors of our coefficient estimates – one measure of how much the data is telling you, and the precision of your results – are only about one tenth those reported by the MAC. We do have to look at a much shorter time period – the MAC data goes back to 1975, ours only to 2002 – but since the MAC in any case choose to split the data by sub-periods, and find different results in the more recent period, this may not be a major loss. It is certainly plausible that the impact of migration on the UK labour market has changed quite a lot in more recent years. Finally, it is important to look beyond the headlines, and doing so one sees that the different results are more compatible than might be thought. We find, as has accurately been reported, that there is essentially no association between immigration and claimant unemployment overall. But the MAC emphatically did not find the opposite, that immigrants overall have an impact on employment at all times. In fact, what their key table – table 4.1, on page 63 – shows is that overall they, like us, find no statistically significant impact. They then cut the data various ways – between non-EU migrants and EU migrants, over different time periods, and between periods of economic upturn and downturn. That gives 15 different cuts of the data, and for 11 there is again no statistically significant impact, while in 4 there is. By contrast, in our report, we similarly cut the data in a number of different ways – for none of them do we find any statistically significant impact of any type. So our results are far more consistent than those of the MAC, which could legitimately be read in a number of different ways. The specific result that the MAC highlighted in their press release, however, is that for non-EU migrants in the period 1996-2010, where they find a statistically significant effect, amounting to a reduction in employment of 23 native workers for each 100 extra non-EU migrants. What should we make of this? For me – and I think for most professional economists – this is a suggestive result, but even if you take it at face value, given that it is only one of many, and applies only to some immigrants for some of the time, not more than that. In addition, it also appears that when the period 1995-2009 is used (ie dropping just 2010) again the results become insignificant. In other words, tweak the data just a a little, and the result is no longer statistically significant. Now this does not mean the results are wrong; this may just reflect the weaknesses in the data I highlighted above. But most economists would place rather little weight on estimates which seemed to fail these fairly standard tests. Finally, I do want to emphasise – returning to my original question of what an informed reader should take from these seemingly contradictory results – that both our report and the MAC’s are important contributions to the debate. The question of what impact immigration has on native British workers, especially the young, is an important one. Economic theory alone does not provide the answer; careful empirical research, and responsible debate, is required. Today’s reports are not the last word, but so far I think the clear balance of the evidence remains that other factors are far more important; immigration probably has no more than a marginal impact. As the Prime Minister has rightly said: "it’s crude and wrong to say immigrants come to Britain to take all our jobs."